DroidVPN for PC is now available! The servers of PD-Proxy will soon be transferred over to DroidVPN. PD-Proxy account will be deleted after 3 months so be sure to migrate them over now to prevent your account from being deleted. We are now lowering our prices to stay competitive in the VPN market. Our previous 1 month premium account subscription is priced at $4.99 and now it is lowered down to $2.99. Our one year premium account subscription is previously priced at $54.99 and now its only $29.99 that's almost 50% off. Aside from the price drop we are also going to release a new version of PD-Proxy, a new design of our website and add more servers from new countries. We will also release a separate application for DNS tunneling. PD-Proxy actually has the DNS tunneling feature before but we decided to remove it because the connection was unstable but we are now bringing it back as a separate application (Not integrated with PD-Proxy). So what are you waiting for? Upgrade now your account! Wait there's more, share this blog post for 300 times and we will also increase the bandwidth of free users to 200MB per day. Most of our users are using PD-Proxy to get a free internet connection. You are just basically going to use a mobile broadband modem(USB Dongle), connect it to your ISP even if your mobile account has no data plan and then connect PD-Proxy. PD-Proxy will basically bypass your ISPs firewall and will let you access the internet for free. I was actually using this since 2008 but then 3G connection provided by Smart, Globe and Sun cellular started to degrade. 3G connection was so unstable that you can't even open a website especially during peak hours. Some even said that it was caused by those free internet users. I work at home so a strong and reliable internet connection is important so we decided to apply for a PLDT myDSL connection. We opted for the 10 Mbps plan which costed roughly 5,000 pesos at that time(that was 3 years ago). Initial speed tests using the speedtest.net website after the installation yielded 9-10mbps download speed and 1Mbps upload speed. But you can't really get that speed all the time when doing your daily internet activites. If I test my download speed using speedtest.net I can easily get 10Mbps download speed but downloading a file from the internet only peaks up to 1-3Mbps and I rarely get 4-10Mbps download speeds. Then here comes PD-Proxy to the rescue. When I am connected to PD-Proxy I can easily reach 8-10Mbps while downloading, YouTube videos no longer buffers while watching, as an added bonus I can now watch Netflix videos. Is PLDT throttling your download speed? I am not really sure if they do, all I know is that downloading a file that is locally hosted is fast but it can slow down up to 50kbps when you are downloading a file outside of the Philippines. There is somewhat like a bottleneck on all internet traffic going in and out of the Philippines but then if you use PD-Proxy that bottleneck would go away. They are probably throttling international traffic but lets the local traffic flow freely. 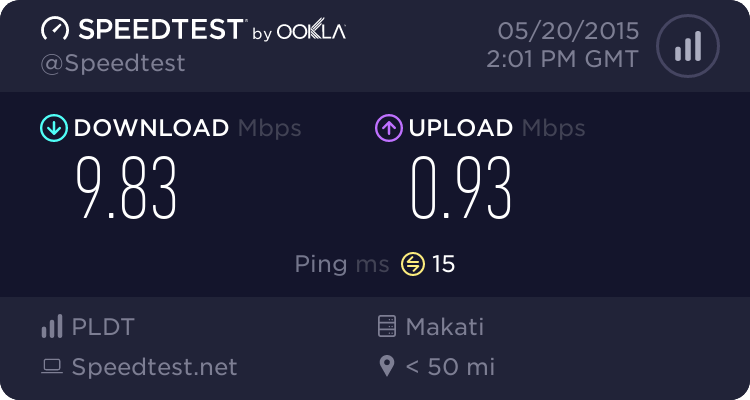 Now that becomes an annoying problem since if you report it to their customer service they would ask you to do a speed test which will of course give you a blazing fast download speed because the file being downloaded is hosted here in the Philippines. What's the use of your 10Mbps internet connection when all you can do is run speedtests. Good thing there's PD-Proxy which let's me use all the bandwidth I am paying for although sometimes using PD-Proxy can't really help if PLDTs connection is really congested in the first place. Now let's see some speed tests. Our first image below shows my internet connection speed. The speed test server is located in Makati hosted by Smart Communications, Inc. This one shows my internet connection speed while connected to PD-Proxy. 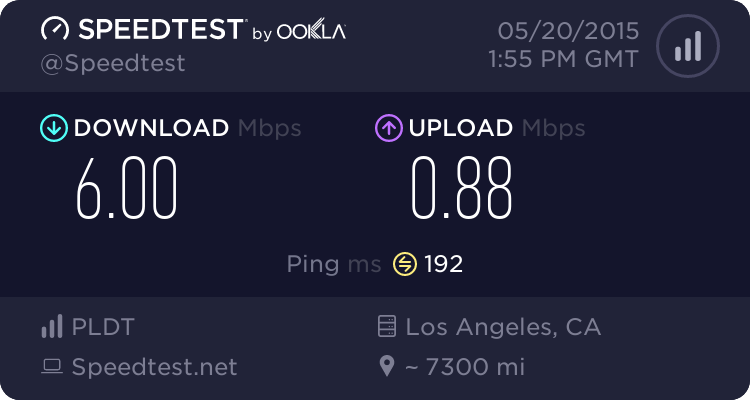 The speed test server is located in Los Angeles. 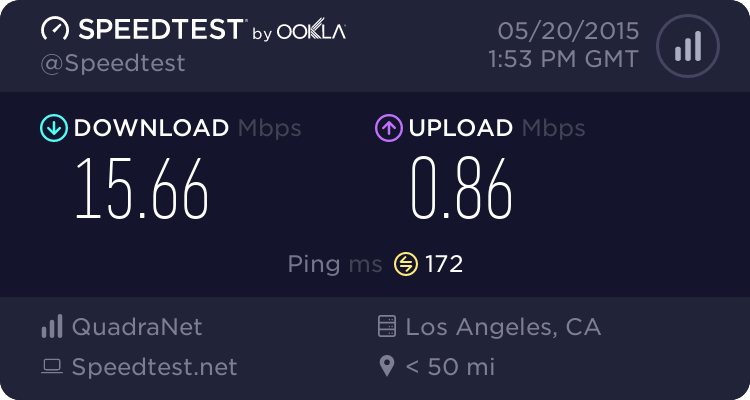 This one shows my internet connection speed while not connected to PD-Proxy but still using the speed test server located in the Los Angeles. My speedtest above even exceeded my 10Mbps plan probably because PD-Proxy compresses all the data its downloading. Is your ISP also throttling your download speed? Try PD-Proxy and let us know if it helps you make your connection faster again. But remember PD-Proxy cannot magically speed up your internet connection if your network connection is really slow and congested to start with. If its still not working please do the following steps. For the VPN to work the "Network Connections" service needs to be running so we need to start that service. Goto search and type "services.msc" and click the "Services" result to open the "Services control panel". Find the "Network Connections" entry and simply change this service from manual to automatic and start it. If it is still not working. Make sure that "RAS Connection Manager" is enabled. Turn On "RAS Connection Manager Administration Kit (CMAK)"
Close "Control Panel\Programs\Programs and Features window"
Have you reach your bandwidth limit and you are wondering when will your bandwidth reset so you can use it again?